The rising and falling of the sea, “the tides,” are a phenomenon upon which we can always depend. Caused by the gravitational pull of the moon and the sun, tides are very long-period waves that move through the ocean and progress toward the coastlines where they appear as the regular rise and fall of the sea surface. The same happens in the Great Lakes, although the largest tides in the Great Lakes are only about 5 cm and are mostly impacted by precipitation, evaporation and runoff. CO-OPS maintains the National Water Level Observation Network (NWLON), an observation network with more than 200 permanent water level stations on the coasts and Great Lakes. 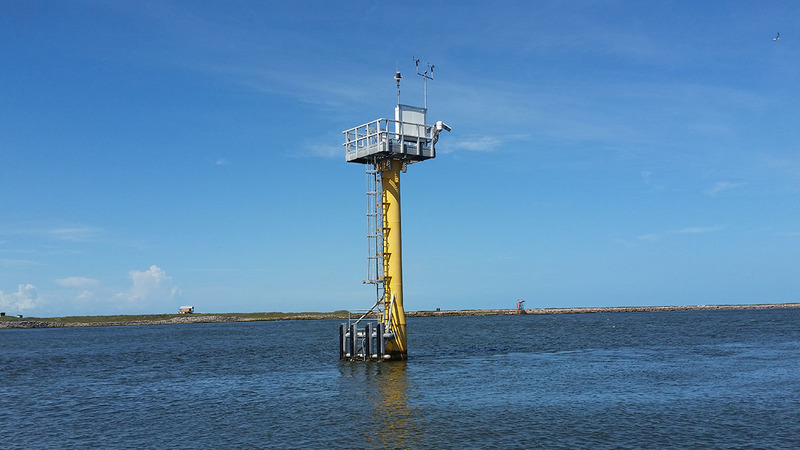 This system allows NOAA to provide the official tidal predictions for the nation. Accurate water level data is critical for safe and efficient marine navigation and for the protection of infrastructure along the coast. The NWLON also provides the national standards for tide and water level reference datums used for nautical charting, coastal engineering, international treaty regulation, and boundary determination. The NWLON is also widely recognized as the key federal component of the Integrated Ocean Observing System (IOOS). NOAA Tide Predictions - NOAA's official tide predictions. Water Levels - Real-time water level information updated every 6 minutes. Tsunami Capable Tide Stations - Real-time water level information that supports the National Tsunami Warning System (updated every 1 minute). Datums - The base elevation used as a reference from which to reckon heights or depths. Tidal datums and International Great Lakes Datum information provided. Astronomical Data - Monthly information for the year on the position of the moon and sun relative to the earth. Tidal Analysis Datum Calculator - Use this web based water level analysis tool to compute tidal datum elevations useful for coastal planning and management. Harmonic Constituents - Information about the different forces that interact to produce tide predictions. Bench Mark Sheets - Details about the fixed physical objects or marks used as references for datums. Water Level Reports - Various water level reports in table and report format. Storm Quicklook - A synopsis of near real-time oceanographic and meteorological observations at locations affected by a tropical cyclone. Inundation Dashboard - Provides real-time and historical coastal flood information at select locations. This NWLON station is specially reinforced to withstand hurricanes and other major storm events. The reinforced stations are better able to keep functioning during these events, providing critical information on water levels and winds that aids emergency response organizations.